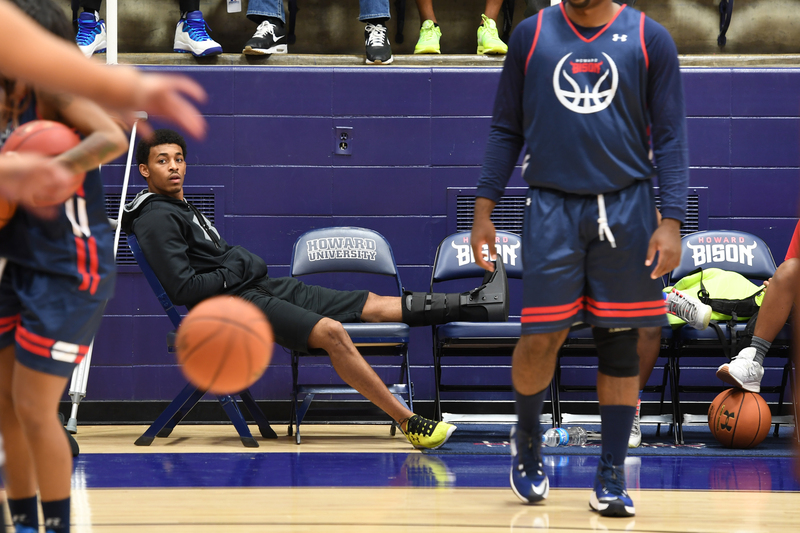 As Milan Brown walked through Howard University’s campus recently, the former Bison basketball star began experiencing a series of flashbacks. Flashback No. 1: He remembered escorting his girlfriend, Tina, down the long steps beside Founders Library and into the space known on campus as The Valley. Leading her to the center of the yard, Brown, a 1993 Howard graduate, knelt and proposed to the then-doctoral student who’s now his wife. Flashback No. 2: Brown, a current assistant coach at the College of Charleston, relived the struggles of a basketball team that never won more than nine games in each of his first two years. But the low point came in his junior year when the team started 2-9: Despite leading the team in assists and being the second-leading scorer, Brown was replaced in the starting lineup by a freshman. Brown’s final flashback? It’s the feeling that comes over him as he walks onto the floor in Burr Gymnasium, the home of the Bison basketball team for the last 53 years, and looks up toward the north end of the gym. In one corner, Brown sees his name and uniform number (25) hanging from the rafters. He was an All-Mid-Eastern Athletic Conference (MEAC) point guard as a senior, and still ranks second on the school’s all-time career list for assists. In the other corner is the blue banner that celebrates the team’s berth in the 1992 NCAA tournament after winning the conference championship. After that first taste of the NCAA tournament, Brown expected to return the next year, his senior season. But the emotional high of that 1992 team, which lost to No. 1 seed Kansas, 100-67, in the first round, was deflated by Howard’s 10-win season in 1992-93. And in the nearly 25 years since that last title, the Bison have finished above .500 just once, with Howard failing to win more than 10 games in 16 of the 24 seasons that followed. The bottom completely fell out during the 1999-2000 season, when the Bison won only a single game, ending the year with a record of 1-27 and the second worst Ratings Percentage Index (312) in all of Division I basketball. 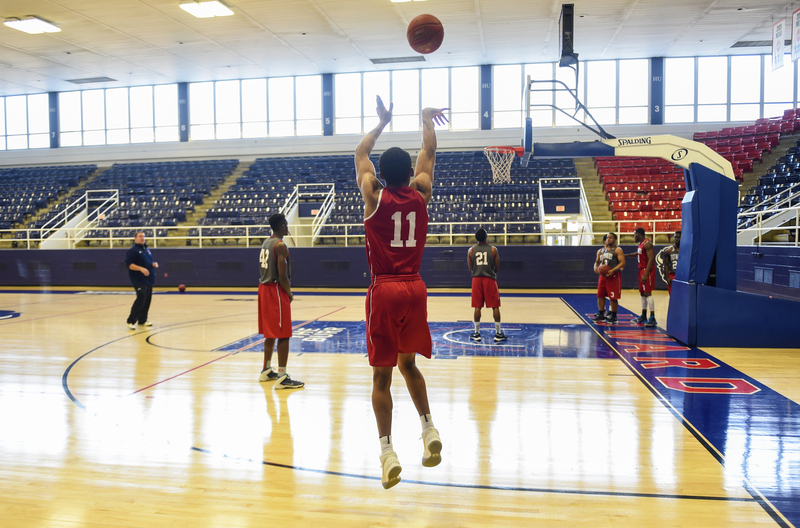 To many alumni, the lack of basketball success at one of the nation’s best-known historically black colleges and universities (HBCUs) — located in one of the most attractive metropolitan areas in the country — has been perplexing. But if you see a basketball player when you enter the aging facility these days, you may notice a certain swagger. Maybe it’s a sense of renewal, with the Bison taking the court on a new floor, courtesy of a new sponsorship deal with Under Armour that will design and provide training gear and uniforms for all 19 varsity teams. Maybe it’s because the team is once again being led by its star point guard, James Daniel III, who led the nation in scoring last season as a junior with an average of 27.1 PPG. Howard guard James Daniel, (11), currently the leading scorer in Division I college basketball, works out at school on December 11, 2015 in Washington, DC. Maybe it’s knowing that it’s a deep team with nine seniors and lofty expectations: The Sporting News, Athlon Sports and CBSSports.com are among the many national media outlets predicting a MEAC regular season championship for Howard, which — if expectations are met — would result in the school’s first postseason berth since that 1992 championship team. Howard represents the celebration of African-American pride, a place where students who’ve attended predominantly white schools discover their blackness. Howard is a launching pad for greatness. It’s impossible to fashion a short list of the school’s top alums when the likes of Thurgood Marshall, P-Diddy, Andrew Young, Donny Hathaway, Zora Neale Hurston and Paul Laurence Dunbar have all walked through its halls. Students are seduced by the school’s rich history and the sense of community it helps to create. An abundance of Howard achievers returned to campus for homecoming two weeks ago: Best-selling author Ta-Nehisi Coates and actress Taraji Henson both hosted book signings. Actor Anthony Anderson shook hands at an event at the Blackburn Center, choreographer/actress Debbie Allen posed for selfies at the football game, and actor/journalist A.J. Calloway happily strolled through the homecoming tailgate, exchanging hugs and handshakes with former classmates and fellow alumni. The members of the basketball team mirror that mix of intellect and inspiration. Senior guard Dalique Mingo envisions becoming a top sports agent one day. Sophomore forward Cameron Lewis, a computer engineering major, expects to own an NBA team someday. And senior guard Kofi Andoh anticipates his studies in chemistry will carry him to a successful career in pharmaceuticals. The top, for Daniel, is the NBA. That’s been his dream since he was in the third grade. He came to Howard because he believed Nickelberry would be the best coach to help him get there. From day one, Nickelberry has given Daniel the green light to be a scorer. Daniel scored 28 points in his first game as a freshman, a win over Washington College. By the end of that 2013-14 season, Daniel was the top-scoring freshman in the nation, with an average of 21 PPG — 14th among all scorers — the MEAC Rookie of the Year. A shift to point guard his sophomore season caused Daniel’s scoring to dip to 16.1 PPG. Injuries decimated the roster last year, his junior season. Starting shooting guard James Miller was averaging 15 points a game when he broke his hand five games into the season, and forward Solomon Mangham missed 17 of the final 20 games with an ankle injury. Daniel was asked to score more and he complied. 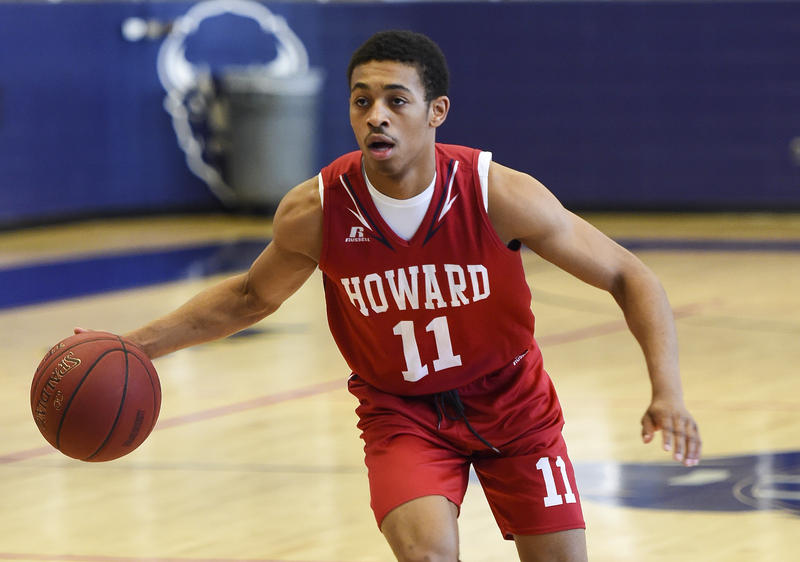 He led the nation with an average of 27.1 PPG, becoming Howard’s all-time leading scorer and only 377 points away from becoming the MEAC’s all-time leading scorer. He didn’t have great accuracy — he’s a career 36.8 percent shooter — but Daniel’s a threat out to half court. His ability to make deep 3s forces defenses to play him tight, resulting in open driving lanes where his great body control allows him to score against bigger players. But the team struggled, finishing 12-20. Daniel avoided serious injuries in his first three years. But he suffered a high ankle sprain during practice two weeks ago. Nickelberry said the injury could keep Daniel out between four and six weeks. “I’ll be back for the opener,” he said. “I’ll be ready for Michigan” on Friday. James J-Byrd Daniel III on the sidelines. Once he does make it back, if Daniel is among the top scorers in the nation again this season, the Bison are in trouble. They need to be more balanced to win the league, with Miller posting the same type of numbers that helped Howard jump out to a 5-2 record last season before his injury. It’s no coincidence that Howard’s 16-16 record during the 2014-15 season came when Daniel had the lowest scoring average of his career. For the team to do well, he’ll need to have confidence in veterans such as Andoh, Damon Collins, Tyler Stone and Mangham, who give Howard one of the deepest teams in the MEAC. And Daniel will have to help guide two key freshmen — Tease and shooting guard Charles “CJ” Williams — who are expected to play major minutes off the bench. Tease, a scorer from Sacramento, California, will likely be the starting point guard if Daniel’s not ready for the opener. Williams, from Richmond, Virginia, could prove to be one of the most athletic players in the league. The real key to Howard’s success, though, will be the play of Marcel Boyd, a 6-foot-10-inch senior center from Accokeek, Maryland, who nearly averaged a double-double (10.4 points, 9.9 rebounds) last season. Historically, MEAC teams have boasted quality guards. But good big men are a rarity, tending to get stockpiled by major programs. If Boyd is a dominant force on both ends when conference play starts in January — and the rest of the team stays healthy — the Bison will be hard to beat. Howard Bison guard Kofi Andoh drives on Purdue Boilermakers guard Johnny Hill (1) in the first half at Mackey Arena. Their success also will depend on Nickelberry, who enters his seventh season at Howard — the longest tenure for a Bison coach since A.B. Williamson’s reign between 1975 and 1990. Nickelberry’s previous head coaching experience was a three-year stint at Hampton, where he had an overall record of 49-44 and 29-21 in the MEAC. That came after a long career as an assistant, including stops at DePaul, Clemson, Monmouth, Holy Cross and Howard. When Nickelberry arrived in 2010, he assumed control of a bad team, and acknowledges he had to hurt the feelings of some of the players he inherited. Nickelberry said his agent told him taking the Howard job would be career “suicide,” and his overall record in six seasons at Howard (59-130) reflects the tough journey. But it’s unfair to gauge his success just by those numbers. He took over one of the worst Division I basketball programs in the nation. And the records of coaches at HBCUs are often skewed by the “guarantee games” they’re forced to play during the pre-conference portion of the schedule, in which the smaller school is guaranteed a hefty payment to help fund its athletic department. Besides the opener at Michigan, Howard plays this season at Marquette, Georgetown, Maryland and VCU. A win or two in one of those guarantee games would be a bonus. For Howard, a dominant record in the MEAC is what’s really important. Winning the MEAC regular season title earns a top seed in the conference tournament. And winning the conference tournament earns a ticket to March Madness. Barring any more injuries this season, Howard fans will have a true gauge on how far this program has come. That growth allows Nickelberry to realistically dream of a tournament berth and a crowd full of star-studded Howard alumni. “Imagine Anthony Anderson, Taraji [Henson], Marlon Wayans, Nick Cannon — all who would be happy to put their HU on and be at those games,” Nickelberry said, getting excited. “Our star power is unmatched – there isn’t an institution in the country that can match it. Can Howard really rebound from last year’s 12-20 record to win a conference title? 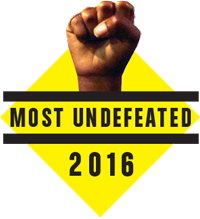 After all, this was the third-worst team in the conference last year. That’s a long leap to the top. While Daniel is confident, Nickelberry offers a dose of caution. The 1991-92 Howard team proved it every night. Ask Brown what it’s going to take for the current Howard team to reach its goals this year, and he thinks back to that special season that ended with Howard’s NCAA tournament appearance. The most important characteristic of that team, though, was confidence. “Even with the way we struggled my first two years, we had to get to a point where we could say with a straight face, ‘We deserve to have this opportunity. We can be a championship team,’ ” Brown said. Looking around the empty stands at Burr Gymnasium, Brown wonders what the players who followed him over the years have thought about when they saw that 1992 NCAA banner in the rafters. Heading toward the exit, he takes one last look at the championship banner he helped hang.